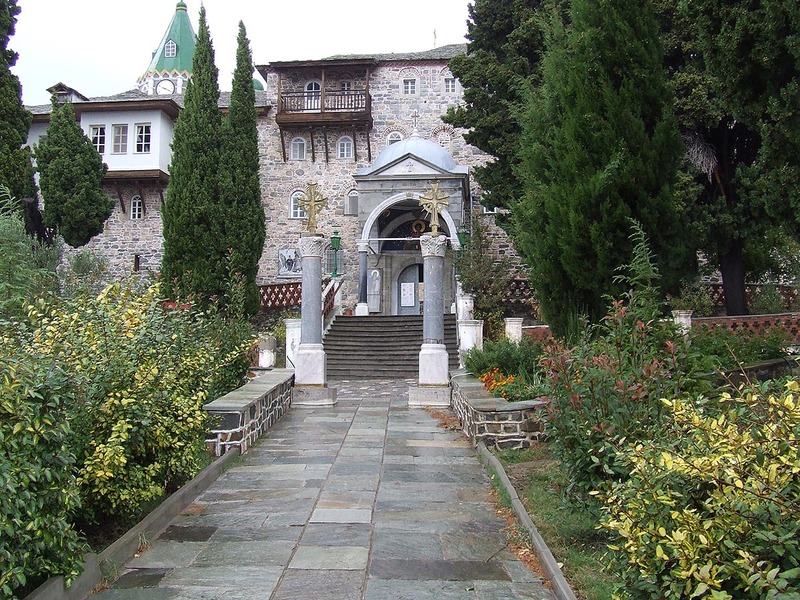 The Monastery Panteleimonos celebrates on the day of Agios Panteleimonas on the 27th of July. 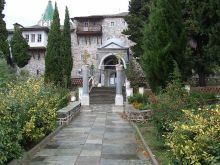 The Monastery that we see nowadays and which was built in 1765, is not the original that is located half an hour from the current Monastery and is known as Paleomonastiro. The old Monastery of Agios Panteleimonas who was also known as 'Thessalonikeos' was founded in the 11th century but was deserted after a few decades. Panteleimona named his contemporaries a doctor whose real name was Pantaleon. His colleauges turned him in to Maximianos the Christian doctor who was working in the courtyard of Nikomedias. Maximianos ordered immediately his punshmetn and decapitation. 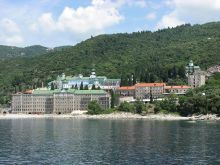 The Monastery is located at the south west coast of Athos near the sea and just an hour from Daphne and the Monastery Xenophontos. 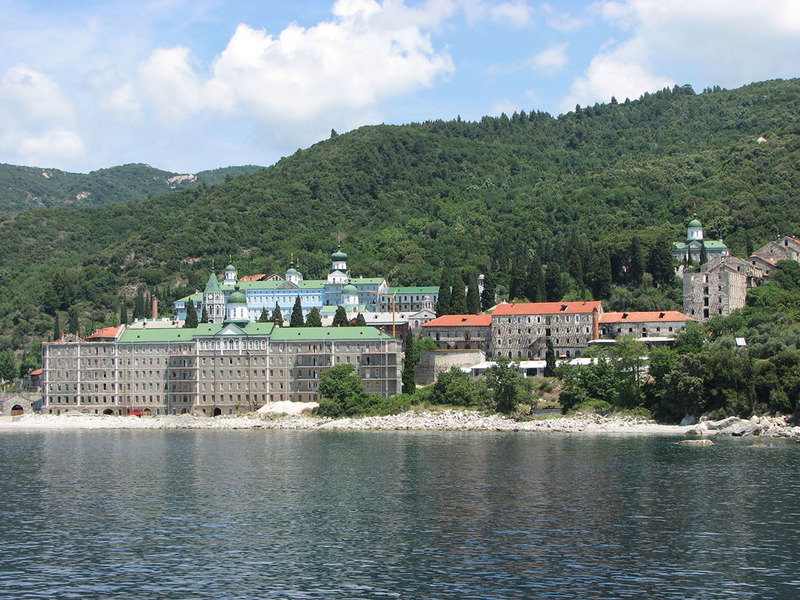 It is the 19th in hierarchy among the monasteries of Mount Athos. Around 1030 a group of Russian monks together with their abbot Laverntios settled in the small Monastery Xylourgou. 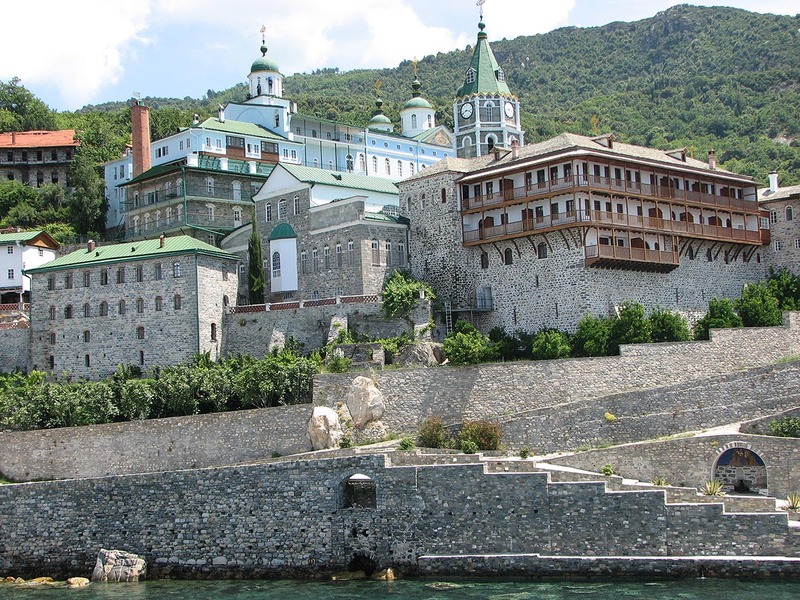 As the monastic community grew bigger, in 1118 the ownership of the administration of the damaged Monastery of Agios Panteleimonos was granted to it by the First and the Holy Assembly of Mount Athos. Unfortunately there are hardly any information about the Monastery in the 12th and 13th century because a huge fire destroyed all the historical data. The first confirmed testimony of existence of the monastery which we have on the ownership structure is from a golden seal of the emperor Andronikos II Paleologos. 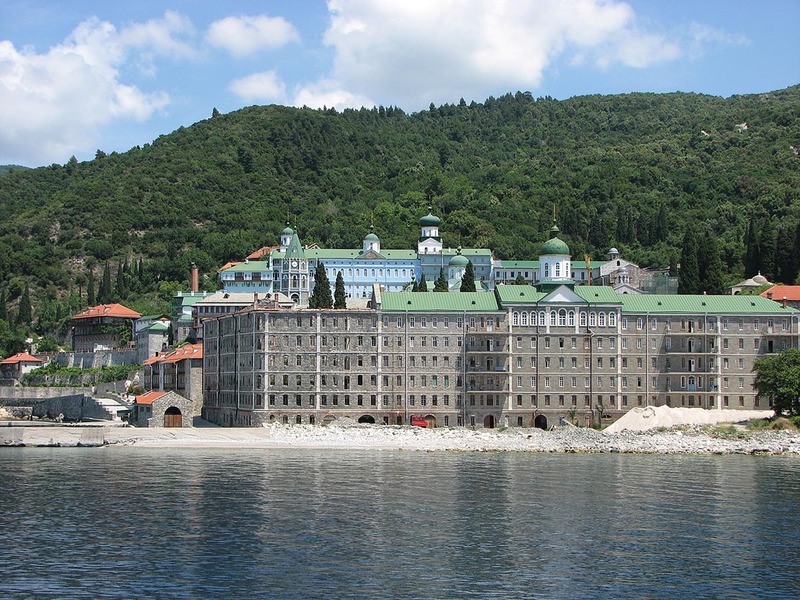 Until 1497 the majority of the monastic community of that era was Greek monks. The development of the monastery continued until the 15th century by donations of emperors and Serb rulers. The Tatar raids in Russia in 1237 resulted in the reduction of the inflow of Russian monks but after the liberation of Russia, a new inflow of Russian monks began and the donations of the tsars in the first years of the 16th century brought back the prosperity to the Monastery. 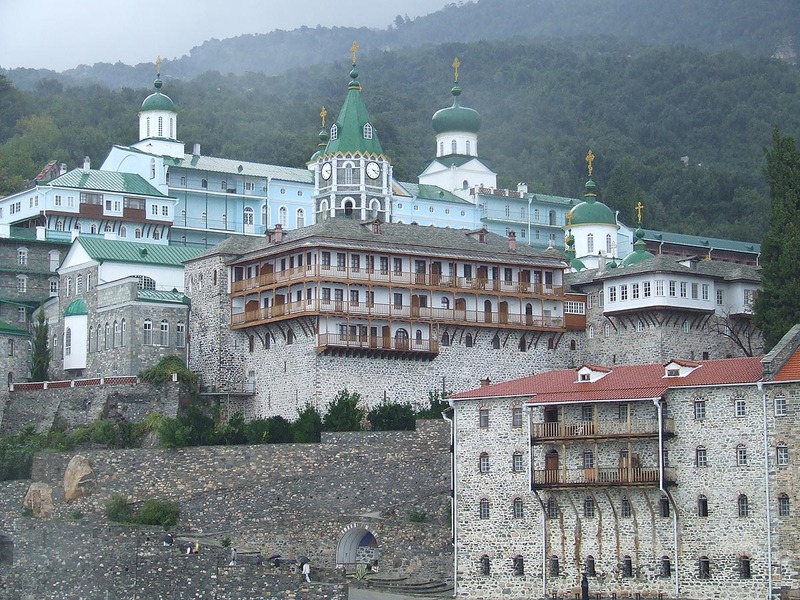 A few decades later an economic crisis broke out and in 1626 the central administration of Athos took over the management of the Monastery. 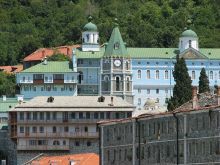 In 1735 the administration of Panteleimonos passed to Greek hands and the Greek abbot decided to construct a new Monastery in another location. So in 1765, Greek and Russian monks began the construction of the coast where a small monastery had existed since 1676, which was founded by bishop of Ierissos Christophoros. The inscription over the entrance of the temple 'selectable Russian' dates back to this period. 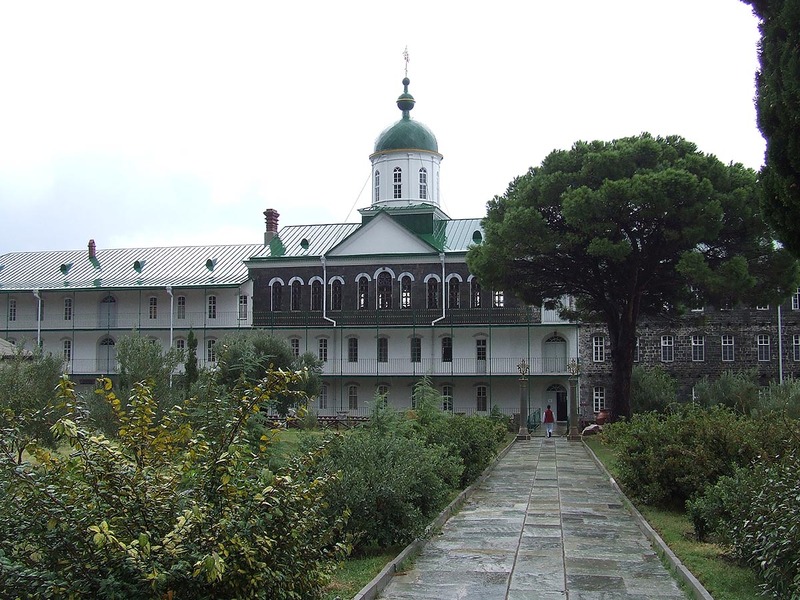 In 1806 patriarch Kallinikos issued a seal stating that henceforth the Monastery will be called 'authentic commune of Kallimachidon'. In 1839 the number of Russian monks continued to grow resulting to the election of a Russian abbot for the first time in 1875. 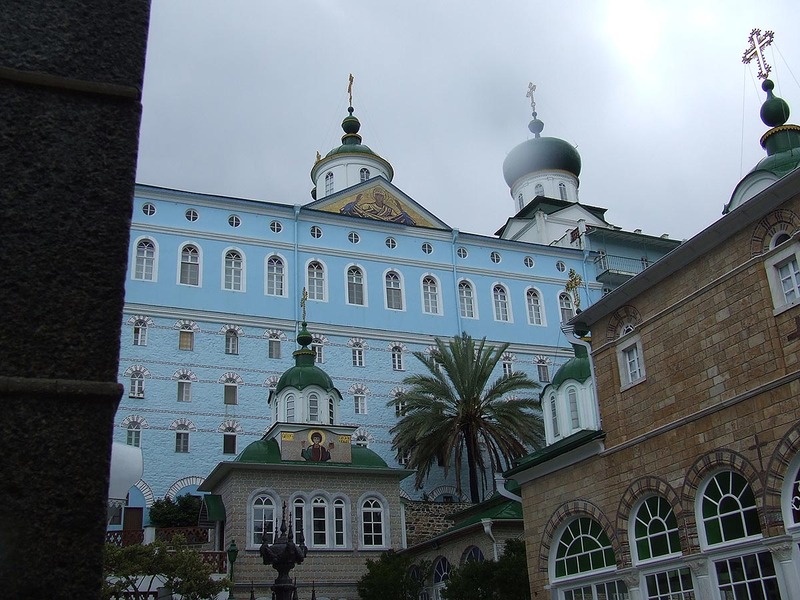 Since 1869, because the abbot of the monastery is Russian, Mass is chanted in both languages. 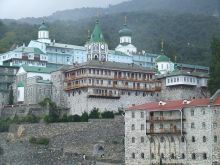 The tsars gave huge sums of money for the extension of the Monastery and the Sketes of Athos where Russian monks lived. 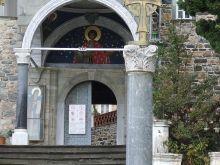 The old Katholikon was built in 1811-1821 and is dedicated to Agios Panteleimonas who is celebrated on the 27th of July. The murals inside are in Russian styles. The Prothesis was built in 1892 and painted in 1897. Over the Prothesis raises the belfry with the bells, including the big bell of the tsar. 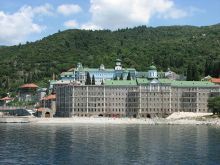 The monastery has 25 chapels, 2 of its 5 Cells are located in Karyes and 2 Sketes. The library has a large number of books in Slavic and Greek, 2,500 printed books, 1,920 manuscripts, a code no. 6, an illustrated preaching of Grigorios, code no. 2, a Lectionary of Byzantine origin. Heirloom, canonicals, sacred relics and treasures as well as several portable pictures are gifts from tsars and other members of the Russian empire. Also there is a piece of Holy Wood, many crosses, cases of remains and pictures such as the picture of the Virgin Mary of Jerusalem and John the Baptist. But the one that is celebrated the most is the miraculous image of Agios Panteleimonas situated in the new temple of the Monastery. According to tradition the picture comes from the small monastic hamlet of Xylourgou, founded in 1030. 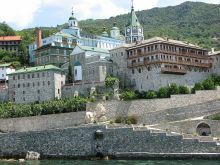 Guests should visit the big belfry made in 1893, with the greatest bell in Mount Athos and the library of the monastery with its rare illustrated manuscripts.